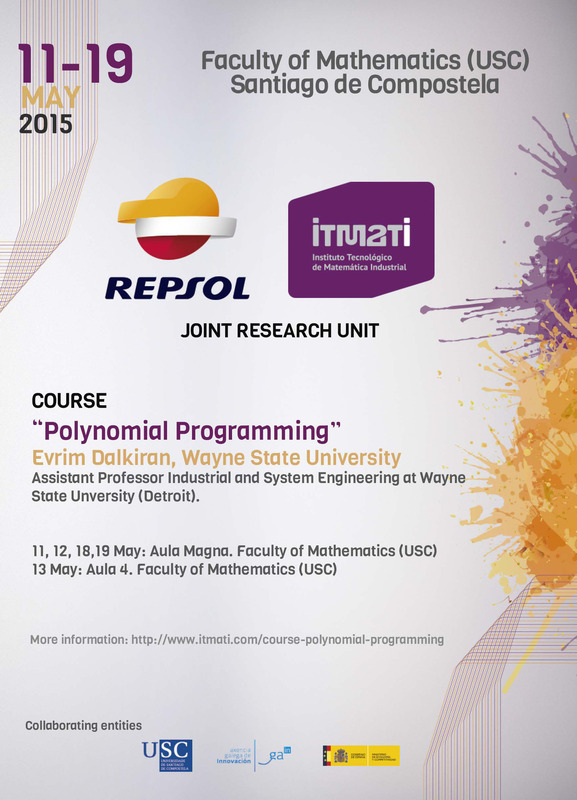 From 11 to 19 May, Evrim Dalkiran, Assitant Professor Industrial and Systems Engineering at Wayne State University (Detroit), will visit ITMATI to give the course: "Polynomial Programming". The course will take place 11,12,18,19 May, in the Aula Magna and 13 May in the Aula 4 of the Faculty of Mathematics, University of Santiago de Compostela (USC). This course is framed as activity in the Joint Research Unit ITMATI-Repsol which has funding of the Galician Agency for Innovation and the Ministry of Economy and Finance in the framework of the Spanish Strategy Innovation in Galicia. REGISTRATIONS: You can confirm your registration in itmati@itmati.com, including your name and your ID, before 8th of May. A certificate of attendance for those who request it be delivered.